Glad to see that US Weekly has discarded last week's 90210 rumbly tummy non-story for a *real* gem of a cinderella tale. 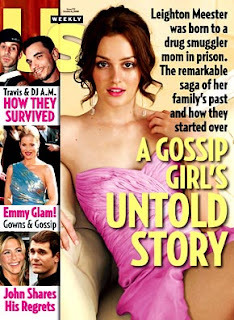 Leighton Meester, Blair from 'Gossip Girl' lets us in on a secret...she was born behind bars. The latest issue, on newsstands today, explores her family's troubled history and how they survived to become the successes that they are today. Wahey! Don't we all love a happy ending?! And she didn't even have to lie about it. Good for Leighton to dish about her past now before E! Hollywood's True Story catches wind of it. A true gossip girl knows that controlling the message is the only way to go.